eHealth Consortium is pleased to announce a free quarterly seminar series in 2012 for members and the public, with the aims to boost the awareness of ehealth adoption for improved care delivery. Limited seats available, REGISTER NOW! Like many other nations/regions including Hong Kong, Australia has embarked on an ambitious national eHealth program which builds on a substantial platform of deployed health ICT. Relative to Hong Kong, Australia?s strengths include very wide usage of health IT by primary care physicians, and its weaknesses include lesser development of clinical systems in the hospitals sector. David Rowlands is Managing Director of Direkt Consulting, which specializes in eHealth, standards, information and performance improvement. He has undertaken a variety of senior roles in the health sector over the last 25 years including health service management, planning and performance management, organizational change and corporate services in addition to informatics. David has a strong commitment to health system improvement through informatics, and until his recent move to Hong Kong was Chair of the Health Informatics Society of Australia and HL7 Australia. He has previously chaired Standards Australia?s Health Informatics Committee and two international working groups on standards for electronic health records. He is a Fellow of the Australasian College of Health Informatics and a member of the editorial committee of the international eJournal of Health Informatics. Healthcare is by nature a global sector, with supply chains that often cross borders. A global standardized system for traceability, from product manufacture to patient treatment, is imperative to comply with the increasing legal requirements for product traceability around the world. GS1?s global standards provide all of the above benefits and implementation guidance. 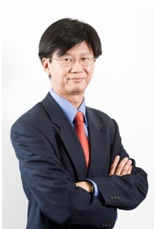 K K Suen joined the GS1 Hong Kong (formerly known as Hong Kong Article Numbering Association) in 1995 with over 27 years of experience in System Development and Consultancy. As Chief Architect and Principal Consultant of both the EPCglobal Hong Kong and GS1 Hong Kong, Mr. Suen's responsibilities include advising local industries on the application of international Supply Chain Management standards and technologies as well as e-commerce infrastructure.� As part of the role, he is responsible for developing and instructing RFID/EPC and EDI/XML/eBusiness training programs and local implementation guidelines to users & service providers. With extensive technical and industry knowledge, Mr Suen is represented at numerous local and international committees and working groups. eHealth Consortium is pleased to announce a free quarterly seminar series in 2012 for members and the public, with the aims to boost the awareness of ehealth adoption for improved care delivery. 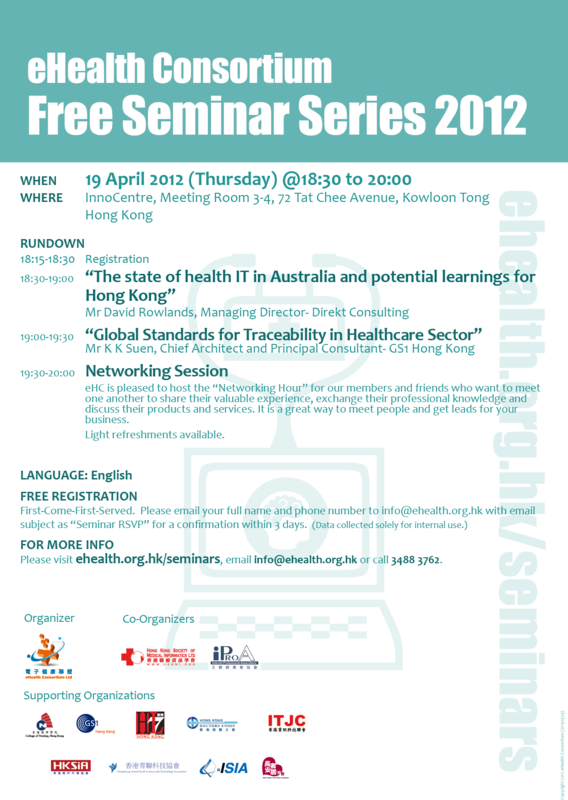 (Updated on 11 Apr 2012) Stay tuned for information on our next seminar in June/July !